As part of an unprecedented month-long campaign for Player Unknown’s Battlegrounds Mobile (PUBG MOBILE), Tencent Games has partnered with the new movie, “Mission: Impossible – Fallout,” which released in theaters on July 27, to deliver all-new in-game content inspired by the film. This latest update, available now, comes just in time for PUBG MOBILE players. 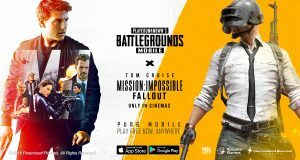 PUBG MOBILE is developed by Tencent Games and PUBG Corp. and based on Player Unknown’s Battlegrounds, the original PC and Xbox One gaming phenomenon that took the world of interactive entertainment by storm in 2017. Up to 100 players parachute onto a remote 8×8 km island to battle in a winner-takes-all showdown. Players must locate and scavenge their own weapons, vehicles and supplies, and defeat every player in a visually and tactically rich battleground that forces players into a shrinking play zone.